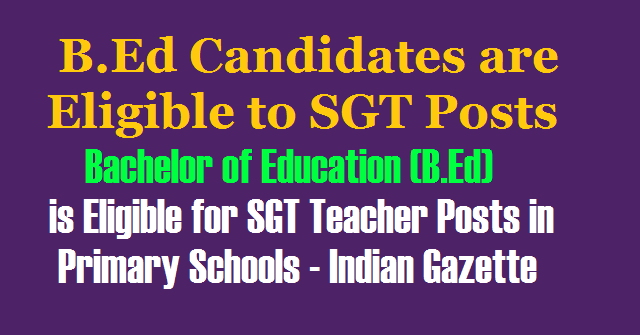 B.Ed candidates are also eligible to SGT Posts, B.Ed is Eligible for SGT Teacher Posts in Primary Schools - Indian Gazette, B.Ed candidates eligible for Secondary Grade Techer Posts in Primary Schools. 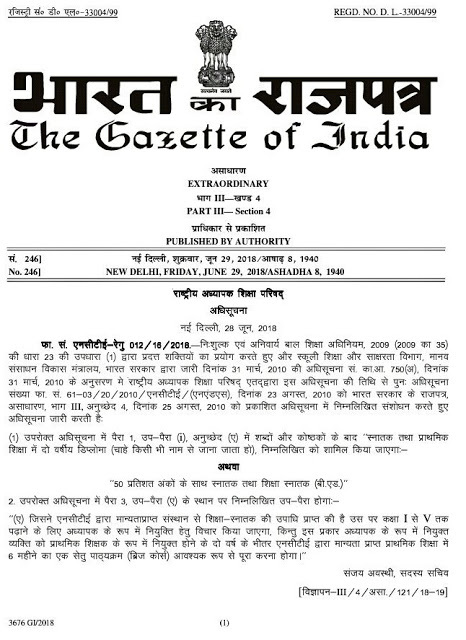 Govt of India has given Gazette notification today for allowing B.Ed. candidates are eligible for SGT posts. B.Ed course is eligible to Teachers Recruitment (i.e AP TRT, TS TRT..): B.Ed Qualified candidates are also eligible to write Secondary Grade Teacher Posts for Primary Schools in India. Indian Gazette, F.No.NCTE Regl 012/16/2018 - NCTE No.249 Dated: 29-06-2018 - Bachelor of Education course completed candidates are also eligible for primary school (I to V) teacher posts. "Graduation with at least 50 % marks and Bachelor of Education (B.Ed.)" "(a) who has acquired the qualification of Bachelor of Education from a NCTE recognized institution shall be considered for appointment as teacher in classes I to V provided the person so appointed as a teacher shall mandatorily undergo a six month Bridge course n Elementary Education recognized by the NCTE within two year of such appointment as primary teacher". 1. 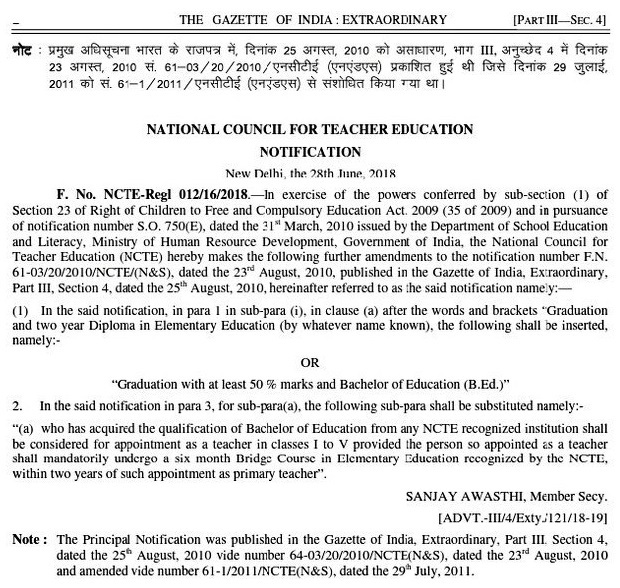 Gazette notification issued by NCTE. The National Council for Teacher Education (NCTE) has released a revised gazette notification for the candidates who completed the Bachelor of Education (B.Ed) are also eligible for Secondary Grade Teacher (SGT) posts. 2. Those who have been selected for the SGT post have to complete a six-month bridge course in NCTE Recognized Primary Education within two years, the Gazette said. 3. Previously B.Ed candidate were only eligible for school assistants (SA) posts. 4. According to NCYE Gazette Notification, B.Ed candidates can now apply to SGT and School Assistants posts. 5. In DSC 2008, 30% of the SGT posts were allotted to the D.Ed candidates. The remaining 70 per cent posts are allotted to D.Ed and B.Ed on merit basis. 6.In DSC 2010, wake of the Supreme Court verdict, 100% of the SGT posts were allotted to the D.Ed candidates. 7. After the partition of the state, in 2014 DSC SGT posts were totally filled with the D.Ed Candidates.